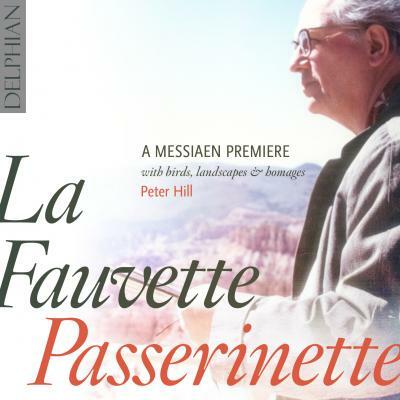 Peter Hill’s latest CD for Delphian (DCD 34141) features the premiere of Messiaen’s recently discovered La Fauvette Passerinette, along with music by nine other composers who form part of the Messiaen ‘landscape’, from Ravel and Stockhausen to Dutilleux, Murail and George Benjamin. The CD has been selected as a record of the year in The Sunday Times, Editor’s Choice in Gramophone, and Instrumental Choice in BBC Music Magazine. Hill places the new work within an exceptionally well-crafted recital in which Messiaen’s music is a recurrent thread in a span of resonances, influences and affinities … The innate poetry and sense of colour that characterise Hill’s complete Messiaen piano cycle are, if anything, even stronger in these new accounts of ‘La Colombe’ and ‘Le Traquet stapazin’ … Whether in Dutilleux or Peter Sculthorpe, Murail or Takemitsu, Hill provides a masterclass in capturing a composer’s idiom with warmth and humanity. What a discovery! La Fauvette Passerinette is a stunning 11-minute piano solo – joyous, syncopated and virtuosic – that Oliver Messiaen wrote (in a ‘faint pencil’) in 1961, then seemingly forgot. It was rediscovered recently by Peter Hill, who sends its birdsong fantasies soaring fabulously in a fascinating disc that puts the French maître in the context of contemporaries (Stockhausen, Dutilleux) and pupils. Now for any admirers of classical music's finest ornithologist the fact that the recording exists at all will be enough for them want it. The fact that it's Peter Hill playing it, one of the finest Messiaen pianists on record – and in his hands it's so obviously such a dramatic and pivotal piece – is another major plus. But – and this is the big thing for me – even without the new piece this is a superbly planned and executed recital, taking us from Messiaen's early love and absorption of Ravel to his own first bird piece [La Colombe], and then setting his development alongside the musical landscape he helped inspire with his compositions and teaching. Works by Stockhausen, Julian Anderson, George Benjamin, Dutilleux, Sculthorpe and Douglas Young; and then, after the new bird piece, affectionate memorials to Messiaen by Tristan Murail and Toru Takemitsu, and a final sight-reading study by the man himself. It's a fascinating and eloquent tribute with notes to match – 'A Messiaen premiere with birds, landscapes and homages' – and it ought to appear on a few 'record of the year' lists before Christmas if there's any justice. Altogether, it is a hugely rewarding and important disc. In absorbingly detailed booklet-notes, Hill explains the innovative aspects of La Fauvette Passerinette … Hill’s realisation forms a rewardingly substantial centrepiece to this outstanding recital disc. Hill has devised a fascinating sequence to contextualise this first recording of an 11-minute virtuoso piece he discovered in Messiaen’s posthumous papers, a faint-pencil sketch but nearly complete. La Fauvette Passerinette … is bitingly fresh. This latest release combines imagination, adventure, discovery and consummate artistry. At its broadest level it is a beautifully sequenced set of 20th-century piano works, from Ravel’s delicious Oiseaux Tristes to the more challenging language of Stockhausen, Julian Anderson, George Benjamin and others. But central to its fascination, among several Messiaen pieces, is the newly discovered La Fauvette Passerinette of 1961, which the pianist – and outstanding soloist here – Peter Hill found and completed … It’s quite a revelation.